No one can honestly say POTUS Trump hasn’t got the best sense of humor since Ronald Reagan. 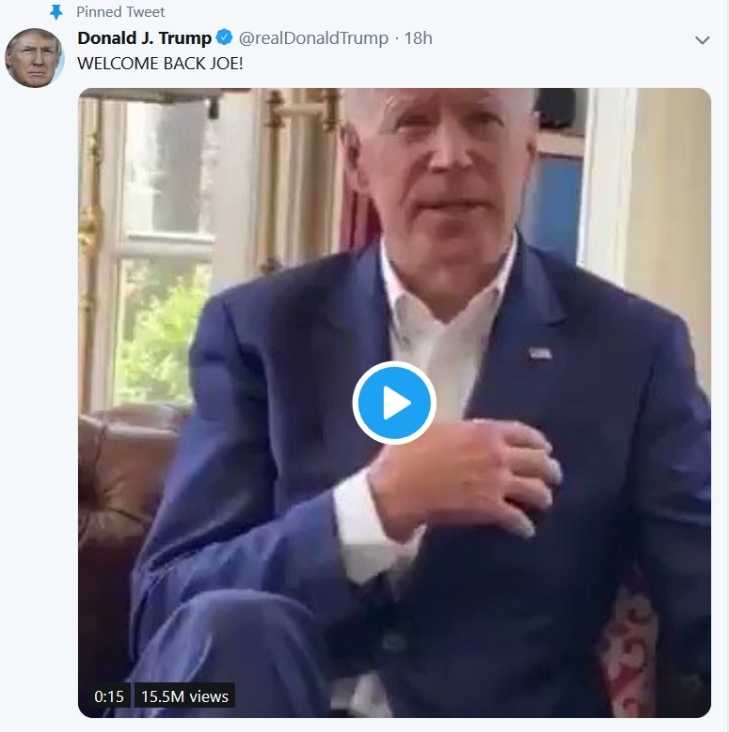 Yesterday (4/04) he tweeted meme master Carpe Donktum’s latest, poking fun at Creepy Joe, entitling it, “Welcome Back Joe!”. “It’s fun to watch Democrats cannibalize each other,” noted Jack Kelly in “The Hit On Creepy Joe” on Wednesday (4/03). Biden certainly has earned his sobriquet with all his pedophilic sniffing and groping on repeated YouTube display. There’s something mentally wrong with this guy. That seems to be an occupational hazard of many if not most professional politicians. Since age 26, Biden has been nothing but – elected a City Council member in his local Delaware town in 1969, then a Senator in 1972 until Obama’s VP in 2008. He’s never earned a real paycheck in his life. Instead, he’s spent his whole life trying to control other people’s lives. That’s what attracts people like him into politics, for there’s something not right with them mentally to begin with. Yesterday (4/04), Patricia McCarthy explained that “The 2020 Democrat Candidates Are Psychotic.” To be psychotic is to be so delusional that you can’t determine what is real and not, and to lack any empathy for other real human beings. If you have delusions of grandeur, feeling you’re more important than anyone else with a compulsion to control other’s lives since you know what’s good for them and they don’t, what do you do? Become a politician. Intelligence has nothing to do with it. Sure, if you’re a moron without the brains to earn a living in the real world yet have a knack for getting people to like you, politics can be the way to go. You might be amazed (then again, probably not) at how many Congressmen and Senators I’ve met over the decades who are jaw-dropping stupid. So let’s take the media’s latest boy-wonder – a kid who’s the Mayor of a small town of 100,000 who thinks he should be President of the United States. Oh, yes, and he’s homosexual, actually married to another man. Pete Buttigieg is obviously smart – speaks eight languages, Harvard grad, Oxford Rhodes Scholar – but he’s also obviously a psycho. Anyone who believes that a majority of American voters will elect a small town mayor as president is just as psycho. Especially when he’s enough of a fascist wacko to support the Green New Deal. Further, no matter what your opinion is of someone’s sexuality, it is a delusional denial of reality to think America is ready to elect as president a man whose spouse is another man. Maybe someday far off, but not in the foreseeable future. Normal Americans look upon politicians as more smarmy than used car salesmen – for good reason, as they sense there is so very often something mentally disturbed about them. 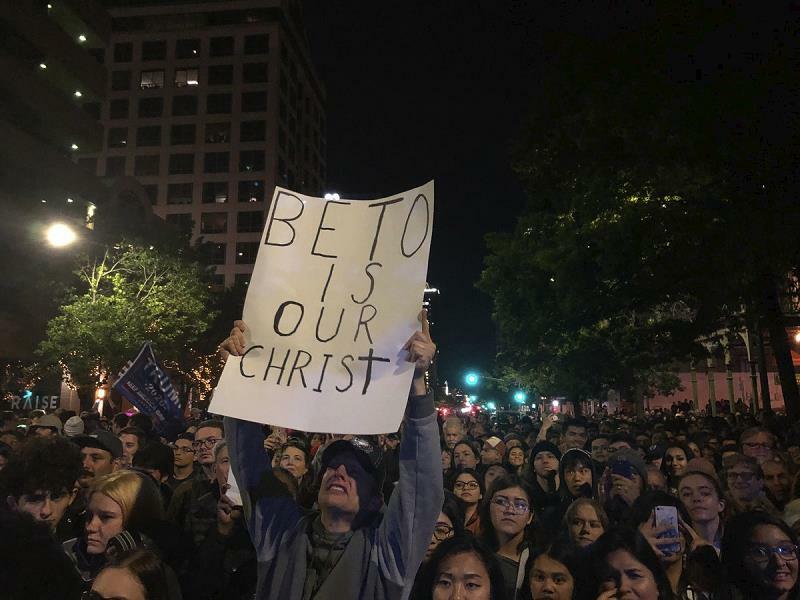 Patricia McCarthy is right – Creepy Joe, Pocahontas Warren, Kneepads Harris, Crazy Bernie, Spartacus Booker, Beto the Pendejo, Pete the Kid Mayor, the whole looney lot of them are clinically nuts. And worse, fascist nuts. For any of them to think they can beat the sanest and smartest guy in the room in 2020 – particularly when he’s the current occupant of the Oval Office – that’s final proof they all need to be carted off to the Funny Farm. 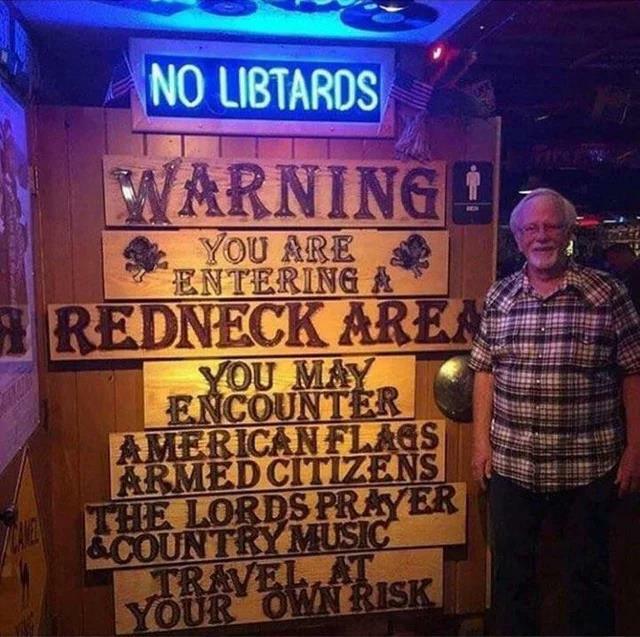 And stay out of our lives. Yet there are herds of the brainless thinking he is their savior. This is how Mao, Stalin, Napoleon and their ilk came to power resulting in the deaths of millions. This is how Barrack Obama got elected – and re-elected. It is the very purpose of the federal Department of Education and the nation’s Teachers Unions to turn children into uneducated unthinking sheep who follow the latest Savior of the State. The result you see is in the picture above. Yes! Go for it all the way, Democrats! Tear your Party apart, burn it to the ground, destroy, pillage, annihilate! We want nothing but smoking ruins by November 2020. It will be your greatest gift to America. “California has gone to hell. Delusional socialists and brazen thieves all over the place. Schools and Colleges are full blown indoctrination camps. The media is just Leftist propaganda. Almost all of the jobs once held by American teenagers are now held by Mexican or Central Americans. The schools, hospitals, roads and apartment complexes are full of COCs (citizens of other countries). Garden Grove and Westminster in OC became fully Vietnamese years ago. Asian slaves staff massage parlors and nail shops in seemingly every strip mall in Southern California. People from India, Pakistan and Iran own all of the 7-11s and hotels. Which brings us to the on-going never-ending always-worsening catastrophe of illegal invasion perpetrated upon our country as an Act of War by the government of Mexico. That is no hyperbole. 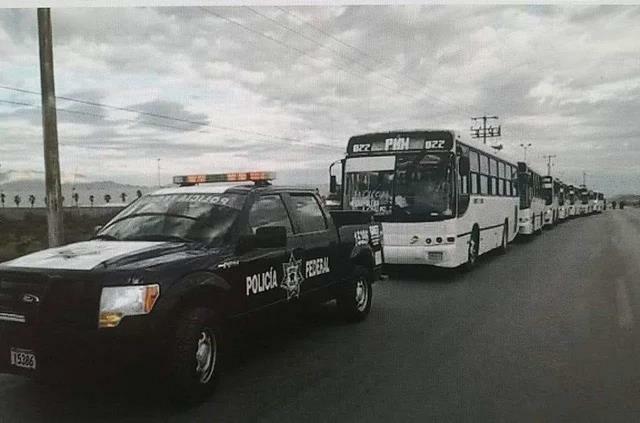 This photo is of a Mexican Federal Police car escorting a huge caravan of buses loaded with illegals to our border so they can escape across it. What you are looking at is an overt Act of War upon the United States. Top advisors insisted over the weekend that he was not bluffing, with acting Chief of Staff Mick Mulvaney telling ABC News that it would take ‘something dramatic’ to stop him from doing it. “President Trump’s Department of Homeland Security (DHS) is continuing its mass release of border crossers and illegal aliens into the interior of the United States, most recently releasing more than 17,000 migrants in less than two weeks. According to Breitbart, US Projected to Add 1.5 Million Illegal Aliens to Population This Year. What can be done? Shut down the border, or course. Declare a form of martial law overriding laws saying any illegal requesting “asylum” must be let in. Set up a defensive perimeter 100 yards or so inside Mexico manned by armed US soldiers to physically prevent illegal entry with painful but non-lethal methods. Deny any form of federal aid, assistance or welfare to illegals. For starters. Kris Kobach yesterday (4/04) presented his proposal, “Three Steps to Solve the Border Crisis.” All three should be implemented immediately. Okay, a bit of happier news. *Saturday (3/30): New York Post reports: ‘Her Heart Is Not in the Bronx’ – Ocasio-Cortez’s Constituents Turn Against Her. For this obnoxious bird-brained Bolshevik to be a one-termer – that would be real social justice. *Monday (4/01): Politico reports: The Republican Senate Is Where House Democrat Bills Go to Die. All those loud-mouth boasting freshmen Dems are learning it matters naught what they do. *Wednesday (4/03): WaPo reports: Mitch McConnell Is Making Senate Democrats Increasingly Powerless. WaPo libtards so unhappy that Dems can no longer delay approval of Trump nominees. Which explains why, from Fox: Feinstein Fumes as Trump Pushes Forward with 9th Circuit Nominees Without Consulting Her. Hahaha! *Wednesday (4/03): Rasmussen reports: After years of Trump/Russia reports, poll shows more Americans believe Hillary was the one doing the colluding. Lock her up! *Thursday (4/04: WashTimes reports: Attorney General Barr Rejects Democrat Demands to Release Mueller Report. Barr is going by the book regarding what redactions are necessary. Dem insults and smears of the Attorney General will be extremely counterproductive. All their subpoenas to interrogate Trump admin officials cannot be enforced if DOJ refuses to do so. They will end up in Barr’s dustbin. The best read on the Mueller Report is Andy McCarthy’s “How Long Has Mueller Known There Was No Trump-Russia Collusion?” Andy nails it. There’s a follow-up to that by prominent veteran British diplomat and ambassador, who calls what Andy is talking about Muellergate. “Which brings us full circle to the DNC leak that sparked Muellergate and the claims that it was the Russians who lost Hillary the election. Robert Mueller repeats the assertion from the US security services that it was Russian hackers who obtained the DNC emails and passed them on to Wikileaks. I am telling you from my personal knowledge that this is not true. William Binney, former Technical Director of the NSA (America’s US$40 billion a year communications intercept organisation), has proven beyond argument that it is a technical impossibility for the DNC emails to have been transmitted by an external hack – they were rather downloaded locally, probably on to a memory stick. Binney’s analysis is fully endorsed by former NSA systems expert Ed Loomis. There simply are no two people on the planet more technically qualified to make this judgement. Yet, astonishingly, Mueller refused to call Binney or Loomis (or me) to testify. Compare this, for example, with his calling to testify my friend Randy Credico, who had no involvement whatsoever in the matter, but Mueller’s team hoped to finger as a Trump/Assange link. The DNC servers have never been examined by intelligence agencies, law enforcement or by Mueller’s team. Binney and Loomis have written that it is impossible this was an external hack. Wikileaks have consistently stressed no state actor was involved. No evidence whatsoever has been produced of the transfer of the material from the “Russians” to Wikileaks. Wikileaks Vault 7 release of CIA documents shows that the planting of false Russian hacking “fingerprints” is an established CIA practice. Yet none of this is reflected at all by Mueller nor by the mainstream media. We alluded to this in last week’s HFR, and noted this is why John Podesta ordered Seth Rich murdered, for it was he who downloaded Podesta’s emails off the DNC computer and sent them to WikiLeaks. Ambassador Murray is afraid that once Julian Assange is kicked out of the Ecuadorian Embassy in London as rumored, he will be silenced to never reveal the true source of the emails that started the whole Collusion myth. Let’s hope that POTUS provides Assange with protection so he can at last tell the truth – and that justice will be served for Seth Rich.